logro bastante sencillo, a modo consejo, recomiendo centrarse en golpear a los grandes, ir dar solo a los pequeños cuando nos pillen de paso, o no tengamos grande en ese momento..
Yeah, annother av which will turn out to be totally annyoing as the game is all random. You want to whack the Hogger 15 times what means doing it every four seconds. Unless they change something - Is this even currently possible? This does not seem to be able to be completed, can't see over 30 points during the whack-a-gnoll game. I counted in my head and I definitely got 45+ a few times and did not get the achievement. I am having the same problem as cookiekitty. I know I have completed it. I do have a question tho, does anyone know if you can complete it on a toon you have already completed the daily with? Don't forget that you can walk right through the barrels, that may save some time. It's actually fairly easy. I got it this morning on the 2nd attempt. Just prioritise Hogger and don't hit the dolls! Consider installing the Darkmoon Faire DBM addon which alerts you when Hogger spawns. Use the mouse to steer and run and 1 on the keyboard to whack! You might need to pull the camera out as well so you can get a good view but not so far out that you can't easily identify Hogger. video of the Achievement being done in Live servers! I got this today even though I only got 30 points. Seems bugged. Got this today on second try. But, i gotta say it depends on pure luck. On first try it said there were 43 possible points, on second one 67 possible points. So better pray RNGesus to spawn more hoggers! You can also have Aspect of the Cheetah/Pack on to help run faster. Just make sure you have it on before you start the game. 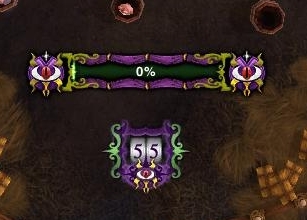 Maybe just luck, maybe it was changed from its usual format, but I got a lot of Hoggers on my first try and managed to get the achievement with exactly 45 points, when I finished DBM popped up saying I "earned 30 of 38 possible points spawned." I guess I can add my 2 cents. The whack a mole booth is the first one on the right as you enter the dmf proper. This can be alot easier for warlocks, when you manage to do the game with Burning Rush active. Therefore you have to cast Burning Rush before starting the game to have it active the whole time. Soul Link and a summoned pet may be required to have enough health for having Burning Rush active that long as Soul Link reduces the damage taken from Burning Rush. I got the achievement in the first attempt with this. Definitely possible with a bit of luck, because every game is random! Always make sure you have your eye on all the barrels at once, because Hogger might pop up right behind you. I also had someone with Aspect of the Pack group me. A little speed goes a long way! Good luck! As a Priest I used to increase movement speed by 15% while using Levitar. It was surprisingly easy, I got 60 points on my first try. They have definitely increased the Hogger spawn rate. DBM makes it even easier by giving you a warning when a Hogger spawns. It's nice to see the points analyzer i put into DBM years ago is finally seeing some use. I put that in because I liked seeing how many points i could earn in a single run and out of how many possible. A personal challenge. In fact I'd even abandon daily and start it again if i didn't complete it in a single run. It's not perfect though. It still has some issue calculating successful hits when not on quest, or when quest is complete. It basically stops tracking once you hit 30 points at present since that's only way it knows you actually HIT one. In Latest alpha/next version, it uses alternate power to detect points more accurately so it can count even when not on quest, and even above 30. Alternate power wasn't available when i wrote original mod. It'll be perfect now! I also lowered hogger antispam threshold from 2.5 seconds down to 2. So it'll alert for them slightly more often but not be too spammy when multiple come up at once. As for achievement. my best was 55/68 on my points. My key tip is to of course go after hoggers, but also keep to a central position after each whack. In addition. waves only last for about 2 additional waves. meaning lets say corner 1 spawns, then corner 2 spawns after, when corner 3 spawns corner 1 is vanishing. excluding ones that spawn at same obviously. This means, if you aren't going to make it to corner one before corner 3 spawns, abandon it immediately and maneuver to corner 2. EDIT, that release is now out. Hogger mod improved! It really seems to be reliant on luck of how many Hoggers actually pop. But my method was to pan the camera to have a top view of the barrels, so you can see right away when the Hogger is about to pop up. Always be running even while swinging the hammer, never stop running even if there are no puppets up (I used my mouse to run and 1 key to hammer). You can run through the middle barrel, but you cannot run through the outside barrels, so try to stay in between the outside barrels and the middle. Don't bother looking at your progress bar it will only distract you. Stay focused and you should get it in a few tries. Good luck everyone! Don't get get too excited how easy this achievement can be because it's not, it's too RNG-dependant. You still can have tons of attempts. Seems like the classes with speed boost have slight advantage. Completed it on my paladin (with +15%) after at ;east 10 attempts. Typical DMF achievement with tons of RNG and frustration. Maybe just a little better than some of the others. Just done it on second try as unholy DK. Of course its RNG dependant, but I´ve got it without much efort. 1) Always go back in the middle after you hit 1 hogger unless you have a 2nd one adjacent. 2) Prioritize Hogger over the little ones but do not wait for it! Prioritize Hogger and if you dont have him up just always run towards middle smashing normal ones only if u dont see Hogger. Did on 2nd try only because i came late on 1st try for one Hogger. Once you get Collera con tachuelas de Hoggito it give's you the battle pet Hogs. Even though you can complete the achievement Se hace camino al golpear on all of your alts you can only carry 1 Hogs per account. You cannot cage it to sell in the AH, and it has no vendor value. So the only way to get him is to do the achievement. Expect it to take 3-4 attempts due to the randomness. Perhaps wait until another player starts a game, it seems like more Hoggers pop when more than 1 person is playing. 54/67 today. It's quite possible, but it does take luck with the spawning. The best strategy is already suggested; scroll out enough to see the entire area, use the mouse to move, and spam 1. Even if you don't think you're close enough for credit, you might be. Also, I find that staying closer to the middle is helpful, but NOT necessary. If you get used to it, you could make it to the opposite position in time before he disappears. You can activate Ímpetu ardiente (use Pacto oscuro before Burning Rush if you specced for it) right before entering the whack-a-gnoll arena and it won't fade away as long as you have the health for it, which means you're moving at 150% speed for the entire duration, making it easier to hit gnolls. Of course, speccing for Grimorio de sacrificio for the extra healing helps you maintain it. Got 55 on first try as warrior with no buffs - proof http://i.imgur.com/6cCLXDr.jpg . Basically its a matter of getting lucky so just keep trying and you will get it. I´m a warlock, but didn´t use Burning Rush. Instead, being a tailor/enchanter, I craft myself a low level boot and enchanted with Vitalidad terránea (very cheap enchant), which gave me 10% speed increase. That and maxxing out the camera, giving full site view, did the trick on my first attempt. This game has got to be glitched. I'm clearly hitting them, sometimes even more than once, but the hits don't register. There are many times where I've literally hit them, but it's like only two thirds of the times I hit them actually count as hits. It's ridiculous! I gotta say...this achieve is pretty...whack...if see what I'm sayin. Half the time when I hit the target it doesn't even count, no matter how close to it I am. Makes getting this achievement a lot more difficult. It seems incredibly RNG dependant on Hoggars spawning. I ht every hogger I sometimes get 30, sometime 44(grr), Just gotta keep doing it until you get lucky. For those having trouble with this achievement. Since Legion you can use the food buff from Bear Tartare to get a speed boots after hitting a doll as it counts as a mob kill. This makes running around doing the game pretty fun and the achievement even easier. I got 53 points the first time I tried for this achievement on an alt with the food buff. It allows you to get to the Hogger spawns lickety–split and eat up those Gnoll spawns no problem. This may get patched out eventually but it feels more like "clever user of game mechanics" than a bug to me. Anyways, hope this helps anyone struggling with the achievement. Modified, yeah this no longer works. Oh my god what have you done blizzard! this game has become even more bugged now. Sometimes hits aren't even counting when your right next to the target but now also sometimes your character just stands there for a few seconds not attacking when you press the attack button! My game crashed when I got this achievement. This happen to anyone else? Luckily, I still got credit for it. i haven't read through -all- of the comments, so i don't know if this has been posted or not. i thought it was going to be impossible on a satellite connection, but i managed to get it after ~52 tries and a couple hours of cursing at my comp. i think, similar to the tonk thing, that more hoggers spawn while there is another person in with you. or at least that's sure what it seemed like. I was having a problem where I was in proper range and would swing at a Hogger but it wouldn't register. Then I figured out that you have to stop, pause a split-second and then swing. Got Hogs the very next attempt! While this may have worked in the past, this no longer works. You have to be stopped before you swing in order for your swing to hit. If you are moving, the first swing stops you and you have to swing again to hit. So, you have to run to the Gnoll, stop, swing, then go to the next one, rinse and repeat. It is very frustrating, and I have spent I don't know how many tries, in several hours, to get this achievement and haven't gotten it so far. Closest that I have gotten was 40. Hope this tidbit of info helps. Good luck everyone! Shortly after posting this, I finally got the achievement! Key seems to be good hand/ eye coordination, zooming out, a fast mouse, plenty of room for moving said mouse, and most importantly of all- patience. Aggramar's Stride and Sephuz's Secret help a lot running to Hoggers. Did the achievement first try on my 169% movement speed set paladin today (although timer was still pretty tight). I already had this from years ago but for some reason I got it again today on the same character. Got another collar that I couldn't use because the pet is unique. I got this on my hunter using the talent Quemasendas, giving 30% movement speed increase. I guess ¡Porrazo! doesn't count as attacking, because I definitely did much better after switching talents. Speed boost definitely helps. I did on a 120 mage with no speed buff and failed 5-6 times so I swapped to a 110 dk who has Zancada de Aggramar and Secreto de Sephuz. Got it on first try. Don't worry about scrolling down; you can only get this pet once. If you get it on any alts it won't let you cage them as they are unique and account bound. Obtén 45 puntos en una sesión de Golpea al gnoll.